In honor of the Miami International Boat Show, we’ve scoured all corners of our marketplace for the finest in marine accessories sure to get you eager to set sail. 1. 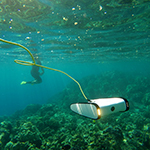 Trident Underwater Drone by OpenROV Price: Contact for pricing Why we picked it: Think that just because you live the Salt Life you’re outside the auspices of the constantly more accessible drone craze? Think again! Packing all the out-of-the-package stimulation that makes these increasingly common hobby objects so popular, the Trident Underwater Drone can dive up to 100 meters, moves at up to 2 meters per second and comes equipped with 1080p streaming capabilities to ensure you can explore the ocean depths effortlessly from the prow of your personal sailcraft. 2. 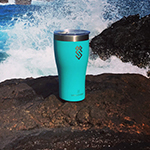 Stainless Steel Insulated Wine Tumbler by Summit Legacy Price: $39.99 per set of 2 Why we picked it: Everyone’s picture of the South Florida boat life inevitable involves potent potables blissfully enjoyed from the prow. The only problem? Rollicking waves do not for a stable sipping surface make. An artful solution to the problem of enjoying wine safely and spill-free from the deck of your craft comes in the form of these wine tumblers, available in a variety of colors and sizes. Where to get it: SummitLegacyProducts.com. 3. 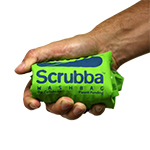 Scrubba Wash Bag Price: Starting at $39.99 Why we picked it: The ingenious solution to a universal challenge that plagues the world over, the maverick mechanics behind the Scrubba Wash Bag have, in one fell swoop, invented an effortless answer to the age-old quandary of shipside laundry and a global watershortage. Requiring a minimum of water and cleaning solution and only slight effort, this knick-knack has revolutionized the way we wear our whites on sea-spanning adventures. Where to get it: TheScrubba.com. 4. 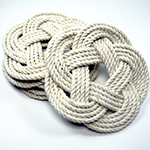 Sailor Knot Coasters by Mystic Knotwork Price: Contact for pricing Why we picked it: The perfect accent for the true sea salt, these Sailor Knot Coasters ensure that even your dinner table displays the deep-seated yearn for the sea you bear in your heart. A handmade holder for glasses you don’t wish to waterstain your precious heirlooms with, Mystic Knotwork offers these handy coasters in a number of notable colors, as well as other products that keep the age-old tradition of nautical knotwork alive. Where to get it: MysticKnotwork.com. 5. 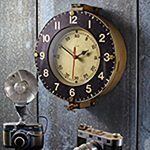 Marine Wall Clock by Pendulux Price: Contact for pricing Why we picked it:A painstaking replica of the timepieces kept on the walls of 1940’s French Navy’s surface ships, this clock guarantees that not only you keep perfect time above the craft you captain, but that your wall will look better for it. Bearing solid brass hardware and an updated internal mechanism that’ll yield accurate timekeeping through any storm, this is one wall accent no true yachtsman should be without. Where to get it: Pendulux.com.